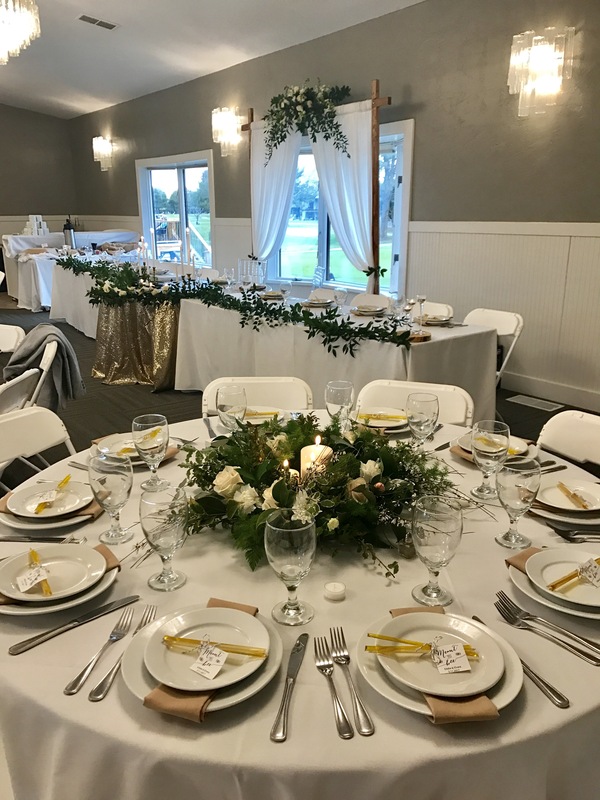 Eagle Hills is a full service event center offering everything necessary to plan and execute a flawless special event that fits your style, personality and budget. 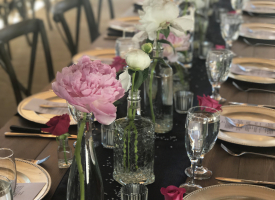 With over 25 years in professional catering, wedding and event experience we are proud to be the venue of choice for the Treasure Valley’s top weddings, charity galas, Holiday parties, class reunions and other special events. Beautiful sunset photo in front of our tree lined pond. Reception in our Cedars Ballroom with crystal chiarvari chairs and navy and blush color scheme. 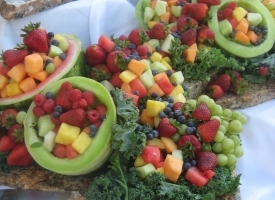 Farmer&#039;s Market Fruit Display appetizer with vanilla bean fruit dip. 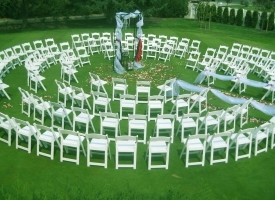 Circular ceremony on the Rose Garden Lawn. Fresh, high quality ingredients and beautiful displays that continue to receive rave reviews. Full menus are available on our catering page. Tables, chairs, linens and napkins in choice of color, silverware, glassware, plates, servers and day-of coordination for no extra fee. Beer, wine, liquor and non-alcoholic beverages are available with your choice of hosting options or let guests pay for all of their own. Dance floors, specialty lighting, upgraded linens and more available for an extra fee, or bring your own. Rental price includes set up. 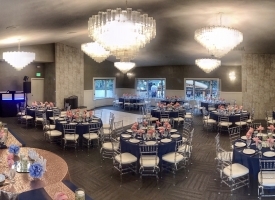 Facilities include our beautiful indoor ballroom and outdoor covered pavilion. Outdoor events may move indoors due to inclement weather. Spacious suite and bath with multiple vanities available for an additional $200 fee. Includes fruit and cheese plate and beverages. 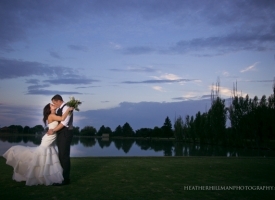 Our outdoor facilities include an open grassy green and covered pavilion surrounded by gorgeous landscaping. 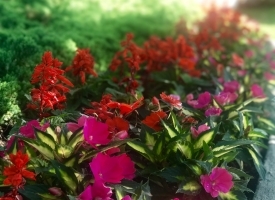 Mature trees provide privacy and shade while the floral landscape offers a picturesque setting for you and your guests. 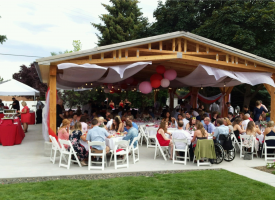 Our pavilion offers plenty of shade while dining al fresco and dancing under the stars with a capacity for 40-200 guests. 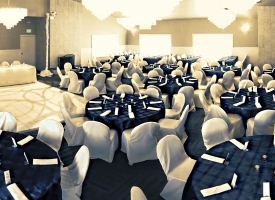 The indoor ballroom was remodeled in 2015 and can accommodate up to 200 guests. It features twenty foot vaulted ceilings, oversized crystal chandeliers, a wood burning fireplace and private entrance with attached patio deck. Contact us for special rates for business meetings and celebrations of life. 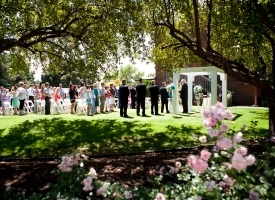 A wedding ceremony can be added to a reception in either our Rose Garden Green, Rose Garden Pavilion or Cedars Ballroom. 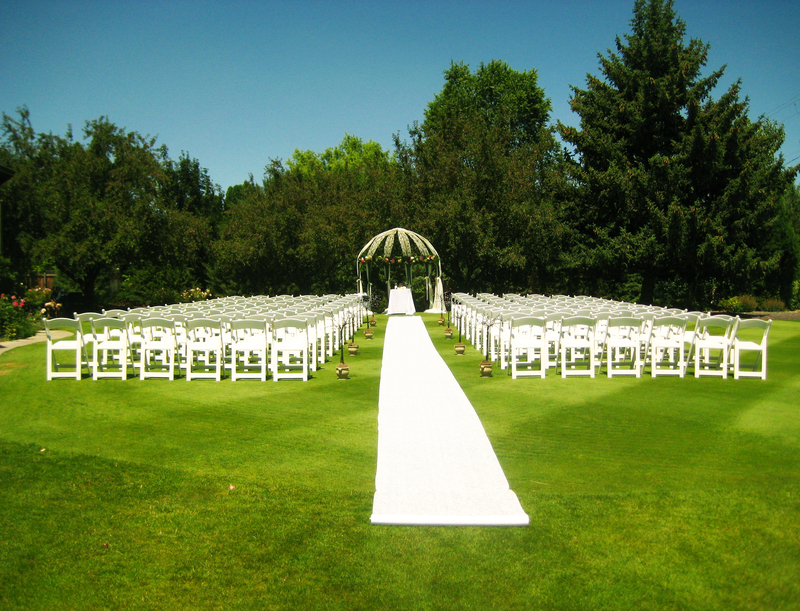 Ceremonies include chairs with set up and take down in your choice of layout and a rehearsal walkthrough. Since we can only host one wedding per day, we do not offer packages for ceremonies without the reception. 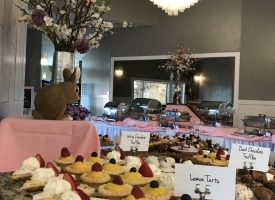 Onsite catering is required for all events, with the exception of wedding cakes and favors, as a package deal with everything we include with our venue. Menu options and pricing are listed on our catering page, or let us create a custom menu for your event. Hosted beverages also count toward this minimum. Both in person and online we continue to receive rave reviews about our flavors and presentation! We would be happy to provide a no obligation estimate to see if we are a good fit for your event. Please also let us know of any rentals you may need or other information we should know. Barnwood tables from Ira + Lucy. 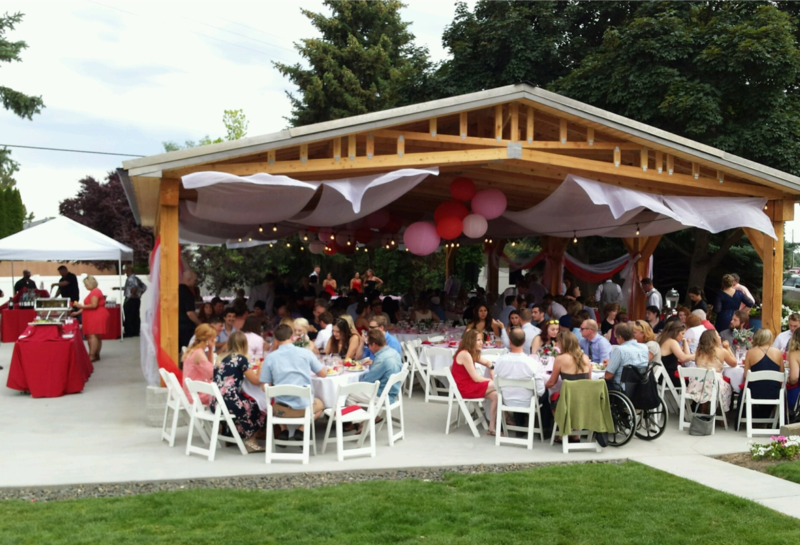 Red and pink reception under the Rose Garden Pavilion for 185. Cake and cupcakes by outside vendor in Rose Garden Pavilion. 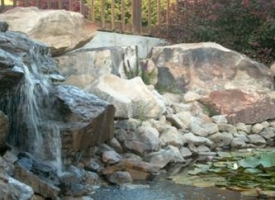 Waterfall and lily pond entrance. Indoor rain contingency. We do not book two banquet events on the same date, allowing for outdoor festivities to move indoors in case of inclement weather. Wedding reception for 150 with navy pintuck linen. Ivory linen with latte napkins accented with gold sequin linen and stunning greenery. Banquet Room and Rose Garden entrance flowers. 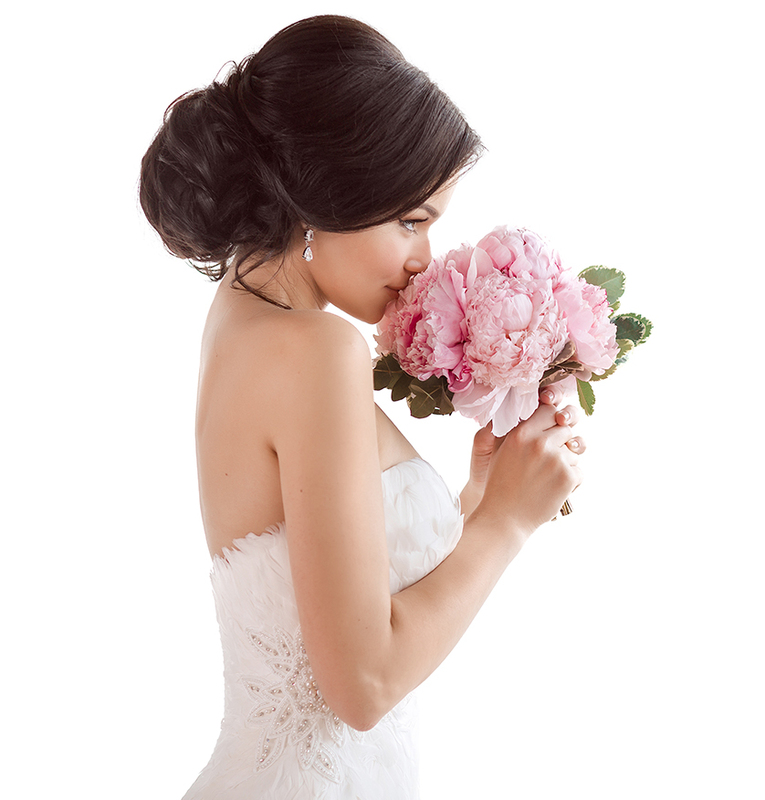 Bridal dressing suite and bath available for an additional rental fee. Gorgeous summer wedding. Photo by Eagle Photography LLC. Lily pond waterfall. Photo by O2. Gorgeous rustic reception with modern touches! Tables by Ira + Lucy. Unforgettable catering is provided on site by our acclaimed chef team. Items are prepared fresh with quality ingredients and modern display presentations utilizing natural stone, fresh herb garnishes, varied heights and menu display cards. Menu items may be presented on a buffet or plated and served to your guests. 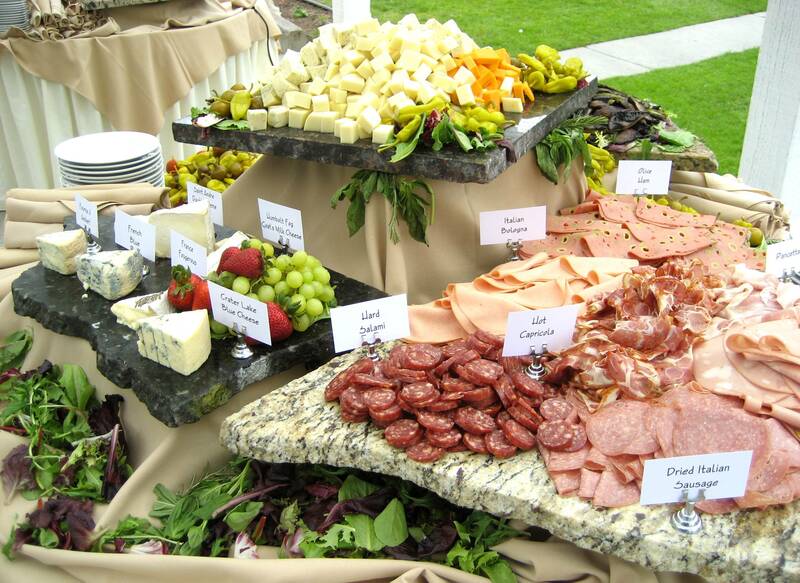 Hors d’ oeuvres may also be offered on buffet stations or a tray pass by our serving staff. Consultations are available if you would like to customize a menu tailored to your event. 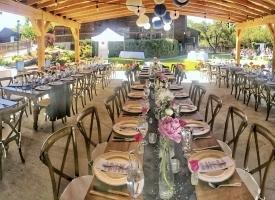 You may specify exactly what you are looking for or provide a general theme and budget and let our catering professionals provide recommendations for the event. 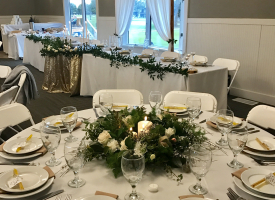 All food and beverage must be purchased through the Eagle Hills’ catering department with the exception of wedding cakes and guest favors. A minimum of $20 per person in food and beverage is required for all events. 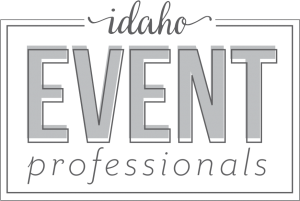 Idaho State sales tax and a 20% service charge are applied to all catering selections. 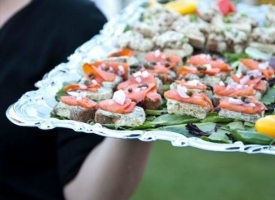 Offsite catering is not allowed, as our reasonable facility fees are a package deal with catering minimums. 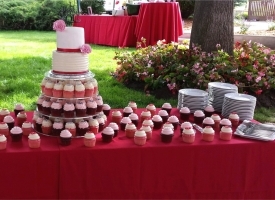 Wedding cakes are an exception and may be facilitated by an outside vendor. For more information regarding catering and our full menus, view the Onsite Catering Page. Chef you killed it! 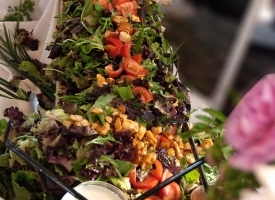 Almost a month after the wedding and we are still getting compliments about the food!” – Whitney, bride. Baby green salad available as a side option to any buffet entree for no additional fee. Bride enjoying our Baron of Beef carving station. 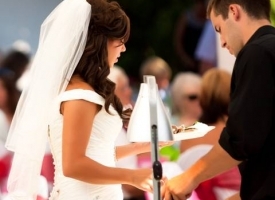 A $550 deposit and contract are required to secure the date of your event. The final menu, guest count, table layout, linens colors and beverage requests are required two weeks prior to the event. Payment in full is required one week prior. Outdoor events may moved inside due to inclement weather. If the hosting party provides notice of the location change by 10:00am the previous day there is no additional fee. Notice after this time may result in an additional $450 set up charge. See our event contract for additional terms and conditions. Office hours are Monday, Wednesday and Friday with weekends available by appointment. Emails are returned daily and generally receive the fastest response. 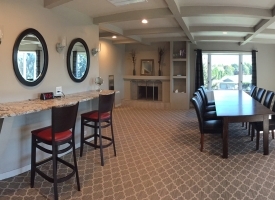 Eagle Hills Golf Course is a public, championship 18 hole golf course, full service event center and casual dining restaurant.